Azamgarh, 31 Mar 2018 [Fik/News Sources]: Darul Musannefin Shibli Academy in its annual Management Committee Meeting elected Mr. Mohammad Hamid Ansari, Former Vice-President of India as its President. Management Committee of Shibli Academy is its supreme body. Very graciously he agreed to serve Shibli Academy and said “I deem it a great honour to be invited by the Managing Committee of the Academy to assume the high office of its President and it shall be my endeavor to assist the Committee in its work of continuing the good work that the Academy and its scholars have done over decades”. Mr. Ansari has served as Vice-President of India from August 2007 till August 2017. He has also served as Chairman of the National Commission for Minorities from 2006 to 2007. He also served as Vice-Chancellor of Aligarh Muslim University from 2000 to 2002. In the past President’s position was held by Maulana Hamiduddin Farahi, Prince Imadul Mulk Syed Husain Bilgirami, Prince Mehdi Yar Jung Bahadur, Dr. Syed Mahmood and Mir Nawab Karamat Ali Khan Mufakkham Jah. Prof. Ishtiyaq Ahmad Zilli, Director and Secretary of Shibli Academy extended his words of appreciation for Mr. Ansari for accepting the responsibility. 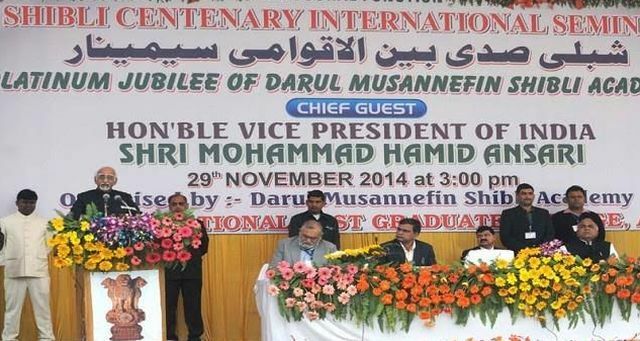 On 29th November 2014, Mr. Ansari attended Shibli Academy Centenary celebrations as its Chief Guest. Selection of Mr. Ansari as President of this Century old Institution has boosted the morals of the admirers of Shibli Academy. Dr. Abdullah of Washington DC who is a member of the Management Committee and travelled all the way from Washington DC USA to attend the meeting expressed his pleasure over Mr. Ansari’s selection. He said ” Mr. Hamid Ansari is statesman and apolitical person with vast experience as a foreign diplomat, Vice-Chancellor of AMU and Vice-President of India for 2 terms . His experience and personality will take Shibli Academy to a new level”. The meeting also elected Dr. Fakhrul Islam as Joint Secretary and Manager of Darul Musannefin Shibli Academy in place of Dr. Abdul Mannan who requested to be relinquished from his responsibilities due to poor health and age related issues. Dr. Javed Ali Khan, Associate Professor of Shibli National College and Mr. Ameer Ahmad of Manappat Foundation of Kerala were also elected as Members of Management Committee. The Meeting was held in the premises of Darul Musaneefin Shibli Academy Azamgarh (UP) India on 28th March 2018 and was Chaired by Maulana Taqiuddin Helali of Al-Ain University UAE. The other members who attended the meetings were, Prof. Ishtiyaq Zilli , Director/Secretary of Darul Musannefin Shibli Academy, Dr. Zafarul Islam Khan, Chairman Delhi Minorities Commission and Editor of Milli Gazette, Dr. Abdullah, Washington DC USA, Prof. Khalid Mahmood, retired professor from Jamia Millia Islamia, Dr. Fakhrul Islam and Dr. Salman Sultan from Gujrat. Maulana Syed Rabey Nadvi, Prof. Reyazur Rahman Sherwani, Mr. Moosa Raza, Maulana Syeedur Rahman Azmi and Prof Zafarul Islam Islahi were unable to attend the meeting for personal reasons.